Initiative 1631 marks an important step in slowing climate-change emissions. And it won't kill the economy. From one angle, it seems like a simple thing. With greenhouse-gas emissions from burning fossil fuels contributing mightily to human-caused climate change, we only need to keep most fossil fuels in the ground. It gets more complicated because the world economy runs on fossil fuels. But if humanity can’t wean itself from oil, coal and natural gas, we face a bleak future. The word “crisis” is overused, but it’s appropriate for the subject of global warming. It is nothing less than an existential crisis. Given the heat and smoke of Seattle’s summer — and other phenomena worldwide — climate change is becoming more difficult to ignore. The question is how destructive our inaction makes it in coming decades. Initiative 1631, up for a vote in November, seeks to take a whack at this Gordian knot. If passed, it would make Washington the first state in the union to impose a carbon tax (although it’s termed a “fee”). 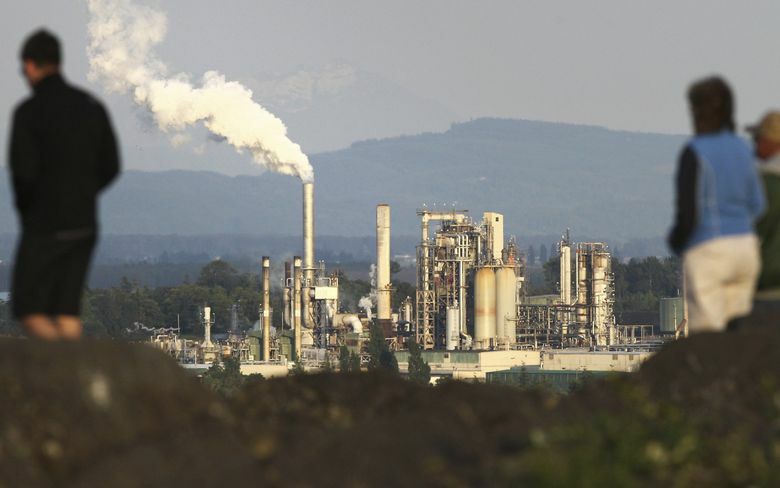 Unlike a failed carbon-tax measure two years ago, I-1631 is carefully crafted to build a wide coalition of supporters, using the money raised to cut fossil-fuel dependency and also help poorer households and communities adjust. The measure could raise almost $1 billion annually by 2023. This makes Washington a beacon in the dark age of Trump, with a climate-change-denying federal government. The measure is attracting big campaign money, including from oil interests in opposition. If it succeeds, I-1631 could inspire other states. Failure leaves us with a status quo that is unsustainable. You’ll read and hear a great deal about the initiative. My charge is to examine the economics. I promise the procedure will be painless. Climate change is a classic example of market failure. In this case, market forces fail because they don’t account for the negative externalities of burning carbon in the global commons of the atmosphere. For example, the pump price of gasoline reflects the expenses of exploration, extracting, refining and transporting the commodity. It doesn’t account for the cost of emissions, which are dispersed and affect third parties. We’ve been getting away with this since the Industrial Revolution — but the world’s population has grown from 1.6 billion in 1900 to around 7.5 billion today. The price mechanism that is so efficient in, say, stocking a supermarket, doesn’t work in this case. And the costs from such a crowded planet belching gigatons of carbon are rising. Policymakers and economists have noodled over ways to fix the market. One response is cap-and-trade, where carbon emitters face government-imposed limits but also have the flexibility to buy and exchange permits to pollute in limited quantities. In theory, this provides encouragement to switch to cleaner fuels and operations. California uses cap-and-trade. As a result, the state has reduced its overall greenhouse-gas emissions to below their 1990 level. Cap-and-trade has its downsides. For example, without rigid caps, it allows polluters to largely continue their practices. The system can be gamed. And it may not attack the largest sources of greenhouse gases. Thus, despite California’s progress, transportation emissions continued to rise. Another response is to directly tax carbon, or in the case of I-1631, impose a fee. British Columbia has levied a carbon tax for more than a decade, at a higher rate than the one proposed here. Price increases for consumers and business did not stop the tax from being popular (and it was instituted by a conservative provincial government). Canadian Prime Minister Justin Trudeau is considering a similar tax nationwide, although opposition from some provinces is strong. I-1631 isn’t perfect. Exemptions are carved out for sectors facing international competition. Controversy attends the 15-person board that will decide how the money is spent. But it would be more than a small start. A report from the Sightline Institute lays out an array of benefits, including cleaner transportation, better public health, stimulating local economies, encouraging renewable energy and saving billions on oil and dirty vehicles. The risk to jobs is a hot button sure to be pushed by opponents of the measure, including oil interests. About 11,000 people worked here in the refining of fossil fuels and manufacture of related products as of 2016, the most recent year for which data are available. Some of these would be at risk. But the fee proposed by I-1631 is modest, especially at first, allowing time for transition. Meanwhile, the carbon fee would encourage development of more renewable energy and use of electric vehicles and transit. The solar industry, for example, already employs far more people than coal mining in the United States. Solar and wind could become substantial industries in Washington. Electric cars are more sustainable here because of hydroelectric power sources. Electrifying railroads — already one of the cleanest and most efficient ways to move goods and people — could further reduce emissions. Renewables aren’t a panacea. They require fossil-fuel inputs in their manufacture. But they are becoming cheaper and more efficient, while research is vaulting ahead. A carbon tax would encourage this. We shouldn’t minimize the changes necessary to ultimately prevent catastrophic temperature rise. We will have to make fundamental changes to our living arrangements. But I-1631 makes an important move. Booming California and British Columbia (and other nations with a tax) show that keeping more carbon in the ground is not a death warrant for the economy. Indeed, doing nothing or putting all hope in techno-magic and “adapting” will ensure rising costs from accelerating climate change. These go beyond lost coastlines, forests and species, storm and heat damage, to encompass more disease, mass migration and war. We’re not past a point of no return. Excuses such as “What about China and India and Africa?” don’t cut it when the planet’s future is on the line. A very different America, not so long ago, led the historic Paris climate accords. The nation will return to the agreement someday. In the meantime, it’s up to the states. Washington will gain far more than it will risk with this historic measure.